First made popular thanks to the Great Bruce Lee and later such People as Jackie Chan and Jet Lee. Wing Chun and Shaolin are now the world's most famous Kung Fu systems. Like most martial arts Wing Chun has roots in the Shaolin Temple. According to Legend once stood a Southern Shaolin Temple and a Northern Shaolin Temple. There are many different Styles of Wing Chun and Shaolin Kung Fu since the Hong Kong movie industry uncovered Bruce Lee and Sifu Ip Man Kung Fu has become very popular in the West. Wing Chun is an effective Form of Self Defence that emphasizes economy of motion and maximum efficiency of movement to allow a student to use an opponent's energy against them through redirection. 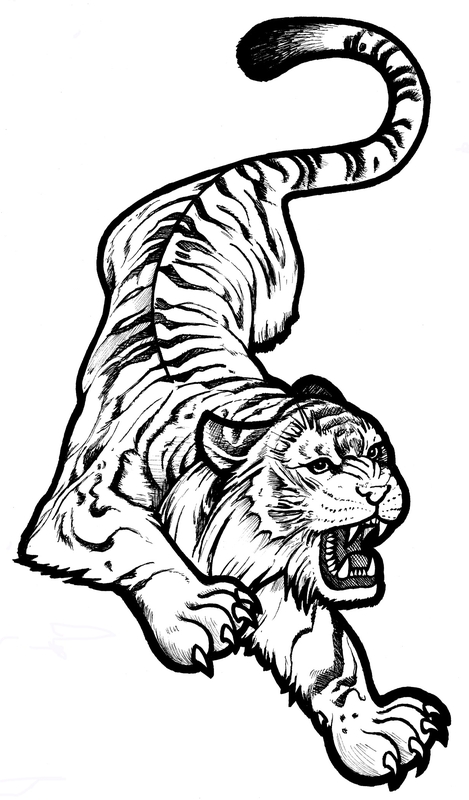 Wing Chun focuses on Speed and Power at short distance and is very effective against grabbing and aggressive opponents. Learning striking locking and throwing techniques through solo forms two person drills, sensitivity and reaction training and light sparring. Benefits of Wing Chun and Shaolin include a better posture, balance and all round general fitness. Its a good, fun way of keeping fit without going to the Gym. 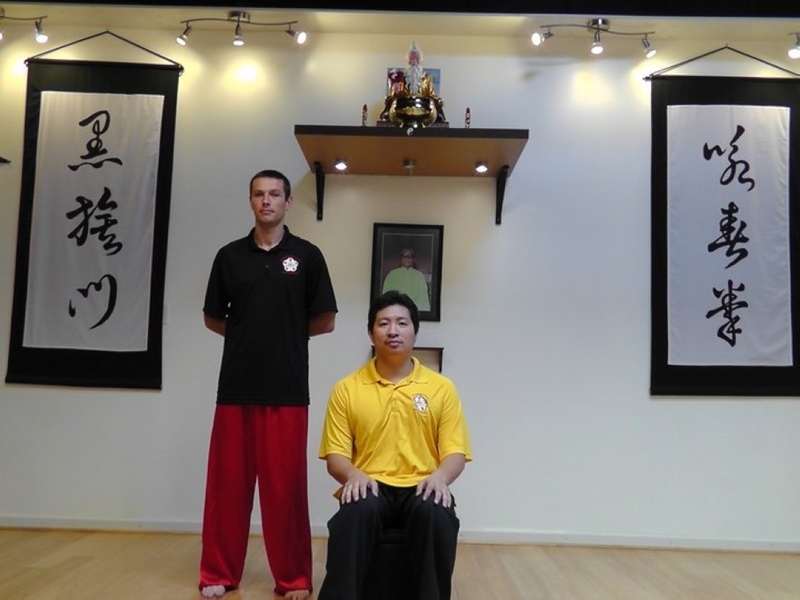 Our Wing Chun linage started With our Senior Instructor , David Friskney of Southampton who is a recognized 4th degree in Ip Chun / Samuel Kwok and founder of F.A.S.T Wing Chun. Dave also a Black Belt in Karate has trained many organizations including the New York Narcotic squad in the use of the stick and Wing Chun. He also run the " Fighting Fit" campaign on Virgin Media and built the foundation of F.A.S.T via his experience with Masters and martial arts over some 35 years. We also trained extensively with other Lineages of Wing Chun including Brixton and Clapham Wing Chun and Shaolin Society in Wing Chun and Northern Shaolin later training extensively with Sifu Lin in Southern Shaolin. We also trained in Sanshou and Tai Chi Kung Fu with Master Xuelong and Master Liu Yong. 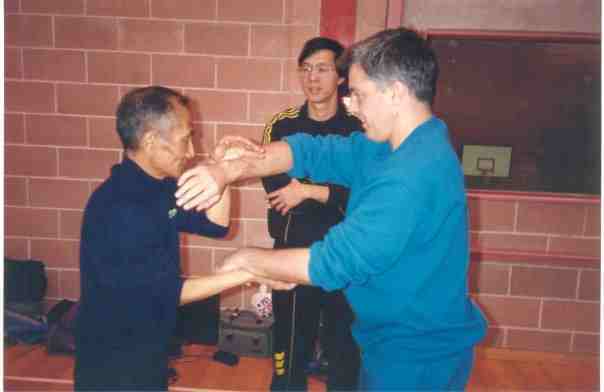 Ip Chun Chi Sau (Sticky Hands) with Master Kwok and Sifu Friskney. We are directly linked to clubs that teach under various masters and are open to anyone with an interest. Please contact us via our Email page.